Following our debut into the world of the slot car racing with Scalextric last month. 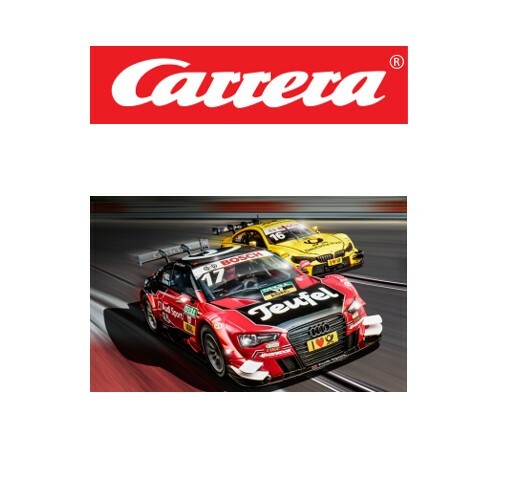 Global brand Carrera joined our line up in March 2019 with their Evolution 1:32 analogue range which like Scalextric is upgradeable to digital. The Carrera track also runs 1:24 cars as well as 1:32 scale. The cars are incredibly detailed, and the tracks are very durable. Model electric car racing has been around for over 60 years. A hobby which has aged well with time and has kept up with modern technology too. The cars are more advanced and with the digital sets you can race using the Carrera and Scalextric apps which can add in pit stops, tyre wear, strategy, race against ghost cars and weather conditions! Add more track and trackside buildings to let your imagination run riot. You can order today racing set, cars and accessories. Our slot car ranges will be expanding all the time and keeping in touch via social media or regular website visits are highly recommended. Our sales desk will be happy to assist with your enquiry. Our range of quality diecast models was launched in October 2018 featuring all the top brands from across the world is getting a spring clean with special offers on all our current stock items. A large number of our items are out of stock because they are no longer available and will be replaced during April 2019. Diecast model cars look fantastic on display at home or in the office or showroom. Many are limited edition models making them great investments for the future. Another major development has been the facility to purchase from our website from the following countries – Europe, USA and Canada, Australia and New Zealand. Please note that Race and Rally World is not responsible for any import duties which maybe incurred. Our shipping values must be declared for insurance purposes. Who is the champion in your home? This year's World Champin's winning car!